Strawberries, blueberries & raspberries…oh my! The only thing better than a homemade Maggie’s waffle is a homemade Maggie’s waffle topped with fresh fruit and homemade whipped cream. Look at this delicious Fresh Fruit Waffle topped with seasonal berries. Order yours with a choice of two fresh fruits: strawberries, raspberries, blueberries and bananas. This scrumptious breakfast will satisfy that sweet tooth any time! This entry was posted on Tuesday, September 22nd, 2009 at 3:18 AM and is filed under Breakfast. 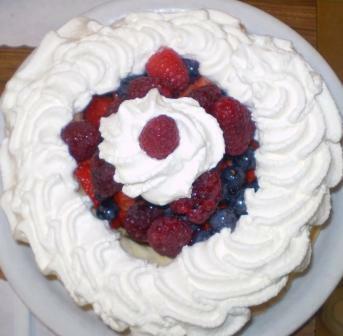 Tagged: berries, fresh fruit waffle, waffle, whipped cream. You can feed this entry. You can leave a response, or trackback from your own site. « Not sure what to order? Try the Griddle Breakfast.